The 1980's brought a lot of economic, political, and social change for all. It was a time where times were changing and technology was advancing too. A lot of my favorites movies, music, and TV shows were from the 80's. I also was born in this decade. Some may look back fondly at the 1980's and wish for a time where things were simpler and life easier. However way you look at it, this decade means something different to everyone. 80sTees.com sells a variety of 80's based shirts featuring music, cartoons, television shows, movies and more. Whether you'd like a shirt featuring a scene from Back to The Future, the Double Dare Logo, or even the Cheers logo, they have you covered and offer much more. Why not purchase a Madonna shirt for the Madonna fan in your life, or a Superman shirt for that Superman fanatic? They also sell costumes, backpacks, blankets, and more. Go ahead and surprise the 80's lover in your life with something that will make them say that's gnarly dude! One of my favorite games of all time is Pac-Man. If I lose quickly when I play, I tend to get mad and frustrated. Those ghosts won't leave my poor Pac-Man alone! They're always chasing after him. Can't they just go away? They look sick, like they need some sunlight too. Years ago I even found an electronic tabletop Pac-Man game that was my parents. I was really excited and played it a lot. I enjoyed bringing the video game experience into the comfort of my own home. You can even find me playing Pac-Man online too. There's just something so addicting about it! Many people share my love for Pac-Man and 80'sTees.com definitely recognizes this. 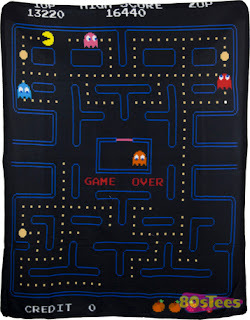 To solidify the love for the yellow one, there's now a Pacm-Man blanket that makes my heart sing. 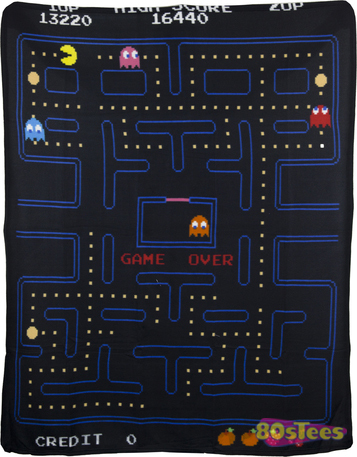 This Pac-Man microfiber fleece blanket features the unmistakable game board on a 50x60 throw. It's thin but features warm and soft fleece. You'll find the non-gamers in your life will end up using it because it's so comfortable, and you'll love it because it's Pac-Man! Stay warm this winter with this fabulous blanket. Let the memories of going to the arcade after school and playing video games trickle in. Also, be prepared to have others want it because it's so cool. I remember sitting down at the big video machine and we'd play for hours! Loved that game and still do! I remember that when we would go to Dairy Queen, my twin sister and I would sit at the Pacman table they had and played until it was time to go. Thanks for the giveaway…my Pac-Man,Space Invaders,and Asteroids memories involve the loss of far too many quarters into the maw of arcade machines in my wasted youth ! I remember sitting on the livingroom floor playing pac mand on the Atari...it was always a fight to get a turn from my brothers! my sisters and I LOVED playing Pac-man. I remember screaming me head off every time I got close to Blinky, Pinky, Inky, or Clyde. Haha. Going to the arcade with the family... playing Pac Man and Donkey Kong. I remember playing the game in the arcade. I remember MTV and the big hair. I remember losing...a lot. I was really bad at pac man but I liked playing it. Oh, and who can forget the pac man fever song? Playing on the arcade machine with my Dad! I remember we had the first Pacman machine in the are placed in our brand new Bowling Alley and there would be people (kids) lining up their quarters on a sill that would also hold ash tray, (yes-I am older than I want to be.) By some miracle know one ever confused who's quarter was next even thou quarters look the same. Go figure? I blogged about this giveaway on my blog. I remember playing this a lot when I was little. Not sure where or on what though. Oh goodness! I used to stay up all hours of the night and play this game! I remember playing this at the local hangout--a pizza shop. We used to have this game in our diner! I remember staying up late playing Pac Man with my Grandma when I was little! I loved playing Pac-Man at the local arcade, I put many a quarter in that game! Mine would be of watching my brothers play, the stinky pants haha would never let me have a turn. when I was younger I would go to an arcade called Megatron in my hometown and spend lots of money on tokens to try to get high scores on PacMan Asteroids, MS Pac Man and Centipede lol...and I actually have an old Atari 7800 at home with those games now! I don't have any memories from the 80's because I was born in 1986. But I remember playing it in arcades in the 90's. I loved playing Pac-man on Atari as a kid! I just remember playing in the arcade at the local skate rink. Back in the day we would sit down and play several games on the atari, I remember always losing at pacman. I would get to mad because the ghosts would get me. I remember playing pacman with my brother all weekend long. I used to play pac man every day in boarding school I made it level 50! I remember when our family would get together my cousins and I would take turns playing my Atari. We thought it was the bomb. I remember when my family would have bbq's or other special times I can remember my cousins and I playing pacman for hours on our Atari. We thought it was the coolest thing back then. My brother and I would play on the old table version at the pizza place. Then I would play the arcade version at the skating rink - 1985. I remember wasting quarters on the game at school. I used to play Pac Man at a pizza place while waiting for my pizza to be made. I loved playing this when I was little! I never caught the PacMan Fever myself but, I remember it used to be in just about every bar and store. I remember Pac Man was one of the one video games I had when I was younger, so I logged a lot of hours playing it. I remember going to the arcades and playing pacman when I was younger. I remember playing it on one of the old school tabletop machines at various restaurants in my area! I used to play at Pizza Hut when they used to have the arcade version.I remember we had to blow on the cartridge everytime Pacman stopped working.There used to be a Pacman cereal that was really good too!I love Pacman. I remember playing Pacman with my brother and sister. I remember thinking it was the hardest game ever!!! I remember playing it on my Atari, and I always loved (and still do) play Mrs. Pacman at the tabletop-style arcade games! When I was 16, 1983, I worked in a Sub Shop. I remember there being a pacman arcade game in the shop and all the teens would come in to play while waiting for their food. I remember playing this in the dentists office with my younger sister. We used to play pac man on the nintedno 64! I remember playing Pac Man at our local pizza joint. The only memory I have is playing pacman in the arcades. I remember wanting to play Pac Man with my older sister, not realizing it was a one player game. She gave me a dummy controller and told me that I was the ghosts. I used to play pac man at the bowling alley/arcade.. man i miss that place. While my boyfriend was playing his space games at the arcade I was always busy trying to beat the high score on Pac Man. Pacman made my heart race! I remember going to the laundromat with my mom and begging her for quarters to play pacman. I remember when my parents bought me the game and it used to make me so scared because I was scared of the ghost getting me. When I was younger I use to go up to the arcade and play this. Fast forward to early 2000s and when my husband and I first started dating he had a pac-man game on his older laptop and we use to challenge each other. Of course, I think he let me win a few times when I got a really low score. We had such fun and I will always remember that. we had an arcade by my house growing up. pacman was the only game i was good at. I used to play at the pizza shop at one of those sit down style arcade games. I loved playing with my brothers and sisters! I remember playing a bit when I was younger, but I wasn't that great. I think this blanket would be great for one of my video game loving friends. I remember staying up late trying to get a higher and higher score. I played Pac Man at the arcade at the campground my family used to camp at when I was little. I was always really scared playing pacman. I always freaked out when I was about to die. I had a friend who got one of the first systems. We use to spend hours playing. I remember playing PacMan at the bowling alley arcade! My brother and I spent hours playing pac man as kids! I used to play Pac Man at the skating rink. It was my favorite game. I played it on the original Nintendo! I remember playing Pac-Man in the arcade with my brothers. I would be soooo upset when the ghosts got to me lol. I use to play with my brother!! i remember my dad playing with me. I remember going to the arcade with my brother and playing pacman. I always loved it. Being a late 80's baby, I haven't any 80's Pac-Man memories. However, since its now on PS3, I enjoy playing Pac-Man and enjoying part of the 80's now. I used to sit with my dad and play pac-man on the atari all the time!! I remember going down to the arcade to play Pacman, ms Pacman, and Centipede. 80's were a blast. My Pac-Man memories are remembered at random places that housed a Pac-Man arcade machine. It was one of the least expensive games to play & you got a decent amount of play time out of it for the price. I used to like it a lot but loved it even more when I saw a Mrs. Pac-Man arcade machine (prob since I'm a girl). It felt like it was a game just for us girls. The original Pac-Man was just as good & kids everywhere still know what it is. So, I'm sure it will live on as a classic for quite some time. Well, I wasn't actually alive in the 80s! But I still love playing Pacman on my PC. The catchy little tune gets stuck in your head for ages. Spending hours (and tons of quarters) in the mall's arcade trying to beat it with my brother... never did! I remember playing the game on my game console. I remember the pac-man arcade machine at the local diner! I remember going to the arcade and playing it and how much fun I thought it was. i remember having a mini arcade-style pacman machine game that was pretty awesome. It was about 10 inches high and had a joystick. Played that thing for hours. And wish i still had it. i remember sitting on the floor in front of the big old wooden tv console playing my atari! I LOVED playing pacman at my friends house. They actually also owned a Ms Pacman machine which is my all-time favorite! I remember eating pizza and playing pacman with friends for hours! We used to go play this at the arcade- it was so much more fun than on the Atari. I didn't have a video game console in the early 80's because we could not afford it. But I babysat for a family that did. I would play Pacman with the kids and have so much fun. I remember playing at the bel-air supermarket - ain't it a shame that grocery stores no longer have arcade machines? Pac Man was one of the most popular games to play in the 80's, when we would go to the bowling ally they had a big pac man machine that I always played. I remember playing Pac-man at the Bowling Alley. My favorite memory is getting dropped off at the gameromm with a whole roll of quaters to play pacman & Tron! It was like a hangout for teens! Playing in the dentist waiting room when I was a kid. I played pac man with my dad all the time. It's the only video game dad liked! This was one of our first Atari games -- but definitely my favorite and most addictive! Wow. Pac Man just screams "80s" to me. I miss it! Sitting in a Lodge at a Ski Resort and playing Pac-man on the machine. I dont play video games now but those old skool times were fun! I don't see my comment so I will try again. I played Pac Man at a Ski Lodge. I dont play video games now but those Old Skool times were really fun!